The Alliance For Democracy - News, eNewsletters, Alerts and Chapter News: Nestlé, don't mess with Mother Nature! Nestlé, don't mess with Mother Nature! Look out, Oregon. Here comes Nestlé. Nestlé has proposed building a bottled water plant at Cascade Locks. Cascade Locks is a small poor community on the Columbia River, desperate for jobs. And so when Nestlé comes to town offering jobs, Cascade Locks is interested. But Nestlé is really offering much more. Nestlé offers to send up to 200 trucks per day into the Columbia Gorge. Cascade Locks has had plans to turn itself into a tourist destination being on the Columbia River, close to fishing and water recreation, in the beautiful Columbia Gorge and near beautiful Mt. Hood and its national forest. What happens to those plans when 200 trucks per day start rolling in and out of tiny Cascade Locks with the increase of noise and air pollution? Nestlé offers to exchange the town's water for Oxbow Spring water, currently used by the Oregon Department of Fish & Wildlife Department (ODFW) at our fish hatchery. Because of questions whether Cascade Locks' water is suitable for the hatchery fish, Oregon required Nestlé to submit to a one year test of the water. However, questions will still remain concerning water quality and temperature. Even if the hatchery fish are not negatively impacted, the effect of the warmer Cascade Lock as it leaves the fish hatchery could still be detrimental to fish in the watershed. Nestlé offers to pay Cascade Locks for the use of their water. But whereas they will pay less than a cent per gallon for the spring water as an industrial ratepayer, they will then turn around and sell the resulting products for on average $8 dollars per gallon. Nestlé will make an enormous amount of profit from our public resource! One further danger results if Nestlé is successful. Nestlé is a multinational corporation. If for environmental reasons, drought or because Oregon imposes future restrictions on Nestlé's water uses, Nestlé could sue under WTO or other “Free Trade” agreements for loss of profits. Oregon could be put in the position of either not enforcing future democratic rights or being forced to pay Nestlé for lost profits. Nestlé should not be allowed to harm the rights of nature by removing water from its watershed, polluting our environment, consuming massive amounts of non-renewable fossil fuels and water in manufacturing and transporting bottled water, and potentially trampling on our democratic rights in order to enhance their bottom line. Water is a human right, not a source of profit. Remember that granting Nestlé the ability to bottle Oregon water sets a dangerous precedence. 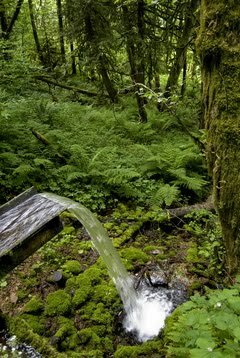 The Oregon Department of Fish and Wildlife must deny the Cascade Locks application to exchange its water for the Oxbow Spring water used by the publicly owned and administrated fish hatchery. Oregon's citizens must be heard on this issue. The Oregon Water Resources Department (OWRD) has provided a 30 day comment period. That period ends on September 30, 2010. OWRD must approve the exchange of Cascade Locks' water for the Oxbow Spring water. Prior to approval, they must consider the potential harm to other water users. That is why your comments now are important. Write your comments NOW! Your comments will be accepted until Sept 30. 2010. Mail by Sept 27, 2010 October 29. Mail by October 26.
Letters only are being accepted. Emailed are not allowed.